Say, wasn’t the future wonderful? 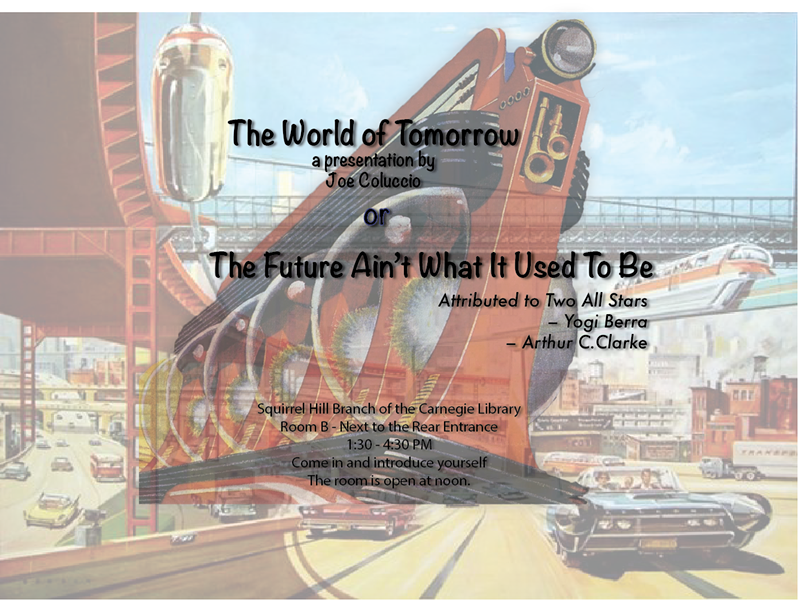 On Sunday, September 16, 2018, 1:30PM at the Parsec Meeting held at the Squirrel Hill Branch of the Carnegie Library - Room B - close to the rear entrance - street parking available there will a presentation on the World of Tomorrow, as predicted by the 1939 New York World’s Fair, the “Disney-sundry-Land/World’s” Tomorrowland, some science fiction gurus and a few surprises. Come for the presentation (a multimedia extravaganza), but also come for the camaraderie and bonhomie provided by the members of Parsec in attendance. We hope to greet and see you all there.